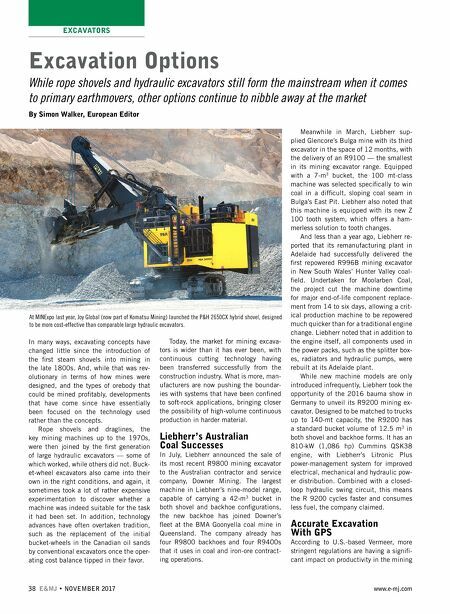 EXCAVATORS NOVEMBER 2017 • E&MJ 39 www.e-mj.com industry at a time when it is already run- ning on thin margins. However, the com- pany said, there are options that can help a mine increase production while at the same time adhering to drill and blast reg- ulations, addressing sound and vibration abatement, and reducing dust to mini- mize the effect on air quality. Vermeer's T1255III Terrain Leveler surface excavation machine (SEM) fea- tures an optional dust-suppression sys- tem, GPS steering and grade control, as well as a cutting-head attachment that can create an 80° high wall. The machine has a fully hydrostatic motor mounted to the side of the cutting head, providing direct drive power to the cutting drum, which uses a top-down cutting action that can dig up to 533 mm (21 in.) deep and 3.65 m (12 ft.) wide in a single pass. As the unit travels forward and the drum ro- tates, the teeth on top of the drum ad- vance over the top of the mineral surface. Operators can also control the size of the material excavated by increasing or de- creasing the tooth penetration to produce a minus 200-mm (8 in.) product. Having a uniform product size also allows more efficient settings on secondary and tertiary crushing systems, Vermeer pointed out. Companies using a Vermeer machine for mining, haul-road construction and site preparation have the option of add- ing GPS-guided steering to help improve cutting accuracy and operator consisten- cy. Developed in collaboration with Trim- ble, the system provides a cutting overlap of 150 mm (6 in. ), helping to enhance productivity with each pass. "Companies have used a variety of methods to steer their surface excavation machines," ex- plained Chris Lynch, sales manager at Ver- meer. "Also, different operators use differ- ent methods, meaning steering methods might change between the day-shift op- erator and the night-shift operator. GPS steering technology helps bring enhanced consistency to the process." Tied in to the GPS technology, the tilting cutting head allows the operator to control the cutting head depth and pitch, which allows the machine to cut to the mine plan — producing a flat surface, a grade for drainage or a sloped haul road. When it was first offered last year, the GPS steer- ing option was available on new machines, with the company working on a system up- grade that would allow it to be retrofitted to Terrain Levelers already in the field. 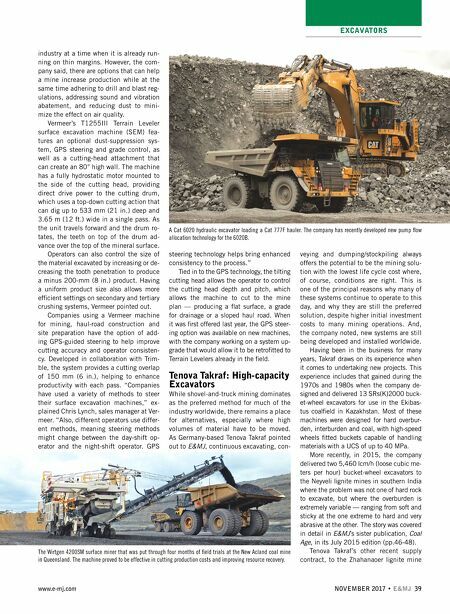 Tenova Takraf: High-capacity Excavators While shovel-and-truck mining dominates as the preferred method for much of the industry worldwide, there remains a place for alternatives, especially where high volumes of material have to be moved. As Germany-based Tenova Takraf pointed out to E&MJ, continuous excavating, con- veying and dumping/stockpiling always offers the potential to be the mining solu- tion with the lowest life cycle cost where, of course, conditions are right. This is one of the principal reasons why many of these systems continue to operate to this day, and why they are still the preferred solution, despite higher initial investment costs to many mining operations. And, the company noted, new systems are still being developed and installed worldwide. Having been in the business for many years, Takraf draws on its experience when it comes to undertaking new projects. This experience includes that gained during the 1970s and 1980s when the company de- signed and delivered 13 SRs(K)2000 buck- et-wheel excavators for use in the Ekibas- tus coalfield in Kazakhstan. Most of these machines were designed for hard overbur- den, interburden and coal, with high-speed wheels fitted buckets capable of handling materials with a UCS of up to 40 MPa. More recently, in 2015, the company delivered two 5,460 lcm/h (loose cubic me- ters per hour) bucket-wheel excavators to the Neyveli lignite mines in southern India where the problem was not one of hard rock to excavate, but where the overburden is extremely variable — ranging from soft and sticky at the one extreme to hard and very abrasive at the other. The story was covered in detail in E&MJ's sister publication, Coal Age, in its July 2015 edition (pp.46-48). Tenova Takraf's other recent supply contract, to the Zhahanaoer lignite mine The Wirtgen 4200SM surface miner that was put through four months of field trials at the New Acland coal mine in Queensland. The machine proved to be effective in cutting production costs and improving resource recovery. A Cat 6020 hydraulic excavator loading a Cat 777F hauler. The company has recently developed new pump flow allocation technology for the 6020B.